Not The Thing, however, which I don't believe see as a great film but still find it pretty compelling and unusual. 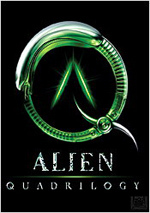 It focuses on the American inhabitants of a scientific base in the Antarctic. Their extremely monotonous lives get shaken one day when an apparently crazed Norwegian helicopter pilot flies into camp and shoots at a stray dog. The Americans attribute these seemingly irrational actions to cabin fever, but we soon find out the real reasons for his shooting spree as something sinister infiltrates the camp. The Thing appears in an aspect ratio of approximately 2.35:1 on this single-sided, double-layered DVD; the image has not been enhanced for 16X9 televisions. While the movie never looked terrible, it certainly presented a lot of room for improvement. Sharpness varied. Parts of the film appeared acceptably well-defined, but many others were soft and without much delineation. Many issues stemmed from jagged edges, as the non-anamorphic transfer showed many instances of roughness. Shimmering was minor, but moderate edge enhancement cropped up throughout the film. A smattering of source flaws also occurred. I saw examples of spots, specks, grit, marks, hairs and blotches. These never became heavy, but they caused more than a few distractions. Colors tended to appear slightly heavy; the film used a blue tint that could be a little overwhelming at times and some hues look somewhat muddy. The movie didn’t use a broad palette, and that made the denseness of the tones more distracting. Black levels were acceptably deep and rich, but shadow detail could look overly dark. Low-light shots tended to be tough to discern. Pack all these flaws together and The Thing added up to a below-average transfer. On the other hand, I found the Dolby Digital 5.1 soundtrack of The Thing to prove satisfying. The soundfield was surprisingly wide and detailed for a relatively old film such as this. The mix appeared quite active and the elements were appropriately located within the environment. Panning between speakers seemed slightly awkward but worked acceptably well. Although I didn't notice much split surround usage, the rear channels added a nice element to the track and helped create a nicely encompassing soundstage. Audio quality was less consistent. Speech was natural and concise, with no signs of edginess or issues connected to intelligibility. Effects were occasionally a little thin but they remained decently realistic. They displayed only a little distortion, most significantly during explosions. Ennio Morricone's score came across very well. It seemed smooth and clear and boasted some good bass at times. It's an impressive mix for an older movie. This track rambles a bit and the participants - especially Carpenter - tend to spend too much time describing the action on screen, but I liked it nonetheless. Both of the guys sound like they're having a great deal of fun as they talk about the movie, and enough interesting information appears to make the commentary worthwhile. We get notes on the sets and locations, story and character issues, stunts and effects, and various production elements. Honestly, even Carpenter's frequent blow-by-blow of what we already see on screen bothered me much less than usual just because the pair are so engaging. Lots of people regard this as an all-time great commentary; I don’t think it’s that good, but I like it. Even better is Terror Takes Shape, a good 82-minute documentary about the film. A wealth of participants appears through contemporary interviews. We hear from Carpenter, actors Russell, Richard Masur, Charles Hallahan, and Joel Polis, effects artists Rob Bottin, Stan Winston, Peter Kuran, Albert Whitlock, and Susan Turner, producer David Foster, screenwriter Bill Lancaster, cinematographer Dean Cundey, editor Todd Ramsay, and production designer John Lloyd. The program covers a wealth of information about the film and provides a very nice overview of a wide variety of topics. I found the emphasis to be a little heavy on the technical side of the equation - I would have liked to hear more from the actors - but the balance seems fairly logical, especially for such an effects-heavy movie. It’s a consistently entertaining and useful program. Production Art and Storyboards details the design of “The Thing” itself through text and a variety of drawings; we see both concept art and storyboards. It also features a few photos, mainly of creature creator Rob Bottin. Through text and photos, Location Design discusses how the filmmakers convinced us the participants were in the Antarctic. Next we see the Production Archives, which relates a variety of information about the shoot itself though pictures and words, and we also learn a lot more about the effects. Post Production includes photos of composer Ennio Morricone (a couple) and the movie's premiere in Hollywood (a lot), plus it tosses in a shot of the novelization cover and an early design for the title. Finally, Production Notes provides a basic overview of the film's creation; it includes a fair amount of information we've already heard. Three other sections offer two different formats within their areas. Each has a stillframe gallery that works like all of those above, with a variety of text and photo elements, but every one of them includes a video component as well. The Saucer provides a lot of information about the creation of the alien ship. The video portion shows all of the different "passes" the camera had to make to ultimately complete the composite image of the saucer in a few different scenes. Blairmonster discusses an abandoned portion of the film that included additional footage of the "Thing" toward the end of the movie. The video part shows the discarded stop motion shots, integrated back into the final scenes. Lastly, Outtakes features other deleted scenes. The still section provides a few photos of segments that appear to have been lost and the text discusses them, while the video area displays about four minutes and 10 seconds of excised scenes that remained available. Some folks aren't fond of still-frame sections, and I admit that DVD makes it a little wearying to wade through them; CAV laserdisc did this much more smoothly. However, I enjoy the wealth of material they offer. Video programs are more "user friendly", but text can provide more detail and depth, and I like programs such as these. In total, all of these departments really help give you a strong understanding of the film's creation. 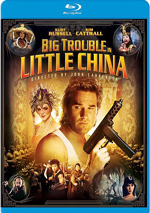 Finally, the DVD adds a Cast and Filmmakers section that includes decent biographies of Russell and Carpenter (what happened to everybody else?) plus we find the film's original theatrical trailer. I guess it's not quite an "Easter egg", but one other extra is pretty well hidden. If you go to the "Languages" menu for the "Terror Takes Shape" documentary, you can activate the film's score. It'll be played as an isolated track during the documentary itself. While it's odd that they didn't have the music run during the film, it's nonetheless a cool little addition. 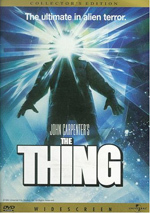 Although it was a financial bomb at the box office in the summer of 1982, The Thing has since gone on to become a minor classic of the science fiction genre. Its delicious melding of sci-fi creatures with Fifties-era paranoiac drama create a film that remains wonderfully tense and unusual. The DVD provides flawed visuals, erratic but generally good audio, and a nice collection of extras. I like the movie a lot, but this is a lackluster release.